On Saturday, October 8, from 1:30 to 4:30 PM, at the Westminster College Hill library, the Colorado Translators Association will offer an SDL Trados Studio training session. The four of us who are going to present met yesterday in a very productive planning discussion. We have a very information-packed outline, and are now busy working on the actual presentations. This three-hour session is meant for users of all levels, provided they have a basic understanding of what a translation memory is. We'll be looking at the translation workflow in Studio 2009: learn how to prepare files for translation, how to upgrade memories, how to create simple and complex projects, how to set up profiles, how to translate and edit and (the icing on the cake) we also will see how to use some useful features such as QA, Autotext and Autosuggest. Finally, we'll get a glimpse into the future, with some of the new features in the upcoming Studio 2011. 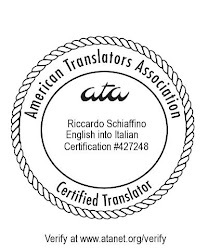 The presenters will be CTA members Anna Kuzminsky, Anouschka Zecha, Riccardo Schiaffino and Margherita De Togni. Registration is already open (see http://cta-web.org/upcoming-events for details). We have space for 20 people and are anticipating this session will sell out, so if you are paying by check, please e-mail Corinne McKay at corinne@translatewrite.com to let her know that your check is on the way. Cost: $40 for CTA members, $50 for non-members, limited to 20 participants. I am sad I missed this. I am interested in learning more about document translation and think this course would be very useful for me. Please let me know if you have one of these in the future.